UN General Assembly votes 128 to 9 to adopt anti-Israel resolution denouncing US recognition of Jerusalem as Israel's capital. 35 abstain. The United Nations General Assembly voted by a wide margin Thursday to adopt an anti-Israel resolution, tacitly condemning America’s recent recognition of Jerusalem as Israel’s capital. 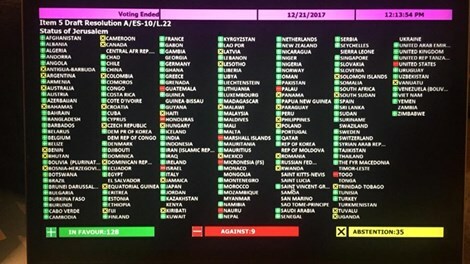 During an emergency session of the General Assembly Thursday morning (New York time), the body voted 128 to 9 to adopt draft resolution A/ES-10/L22, rejecting President Trump’s recent declaration recognizing Jerusalem as Israel’s capital city and chiding Israel over illegal “actions in Occupied East Jerusalem”. An additional 35 nations abstained from the vote, while another 21 did not participate. 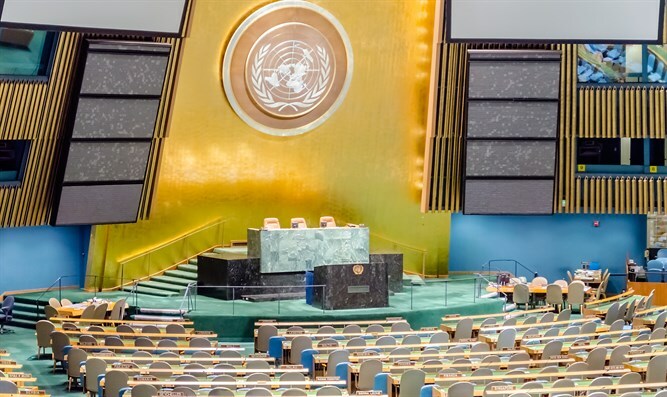 The nine countries which voted against the resolution included the United States, Israel, Guatemala, Honduras, Marshall Islands, Micronesia, Nauru, Palau, and Togo. Australia, Mexico, Argentina, Benin, Canada, Poland, Croatia, South Sudan, Uganda, Romania, Rwanda, Malawi, Lesotho, Latvia, Hungary, Colombia, Jamaica, Fiji, and the Czech Republic were among those member states which abstained. On December 6th, President Donald Trump announced that he was reversing decades of US policy vis-à-vis the Israeli capital, declaring that the US recognized Jerusalem as Israel’s capital city. The president also announced that had ordered the State Department to being work to relocate the US embassy from Tel Aviv to the Israeli capital. The move, praised by the Israeli government and some US lawmakers, drew criticism from many European leaders and much of the Arab world. Egypt’s UN delegation, which currently holds one of the ten temporary seats on the UN Security Council, submitted a proposal condemning the US recognition of Jerusalem, and declaring it null and void in international law. On Monday, the US vetoed the resolution, which was backed by all 10 temporary Security Council members and the four other permanent member states – China, Russia, the UK, and France. By Tuesday, it was reported that Arab states were planning a similar resolution in the General Assembly. During the special meeting, American Ambassador to the UN Nikki Haley slammed the international body, calling it a “hostile place for the State of Israel”. "To its shame, the United Nations has long been a hostile place for the State of Israel." "It's a wrong that undermines the credibility of this institution, and that in turn is harmful for the entire world." Before Thursday’s vote, President Donald Trump warned General Assembly member-states which receive American aid that the US would be “watching” which countries vote with the US, and which vote against it on the resolution. “They take hundreds of millions of dollars and even billions of dollars, and then they vote against us. Well, we’re watching those votes. Let them vote against us. We’ll save a lot. We don’t care,” he told reporters before the Cabinet meeting, according to Reuters.